Amazon.co.jp： Exam Ref 70-345 Designing and Deploying Microsoft ExchangeServer 2016: Steve Goodman, Brian Reid: 洋書. Fishpond Australia, Exam Ref 70-345 Designing and Deploying MicrosoftExchange Server 2016 by Brian Reid Steve Goodman. Exam Ref 70-345 Designing and Deploying Microsoft Exchange Server 2016. Exam Ref 70-345 Designing and Deploying Microsoft Exchange Server 2016: Amazon.de: Steve Goodman, Brian Reid: Fremdsprachige Bücher. Amazon.com: Mastering Microsoft Exchange Server 2016 (9781119232056): Exam Ref 70-345 Designing and Deploying Microsoft Exchange Server 2016. Exam 70-492: Upgrade your MCPD: Web Developer 4 to MCSD: . Książka: Exam Ref 70-345 Designing and Deploying Microsoft Exchange Server2016 Steve Goodman Brian Reid. Exam Ref 70-345 Designing and Deploying Microsoft Exchange Server 2016 Books recipe sources. Buy Exam Ref 70-345 Designing and Deploying Microsoft Exchange Server2016 by Steve Goodman,Brian Reid in India. Audiobook Exam Ref 70-345 Designing and Deploying Microsoft ExchangeServer 2016 Audiobook free online. Exam Ref 70-345 Designing and Deploying Microsoft Exchange Server 2016: Steve Goodman, Brian Reid: 9781509302079: Books - Amazon.ca. Microsoft Exam Ref publications stand apart from third-party study guides because they: Termin ukazania się książki: 2016-07-09 Exam Ref 70-345Designing and Deploying Microsoft Exchange Server 2016 Steve Goodman Brian Reid. View changes: 2016-02-04 12:03 8 new words, 4 deleted words, <1% change Microsoft Exchange Server 2013 70-345: Designing and Deploying MicrosoftExchange Server 2016 (beta) 70-346: home faq policies contact website panels tag reference. Find helpful customer reviews and review ratings for Exam Ref 70-345 Designingand Deploying Microsoft Exchange Server 2016 at Amazon.com. Definitive Guide to DAX, The: Business Intelligence with Excel, SQL Server Exam Ref 70-345 Designing and Deploying Microsoft Exchange Server 2016. Paperback by Steve Goodman Microsoft Press. The exam will validate knowledge and skills for designing, deploying, and troubleshooting for Exchange Server 2016. 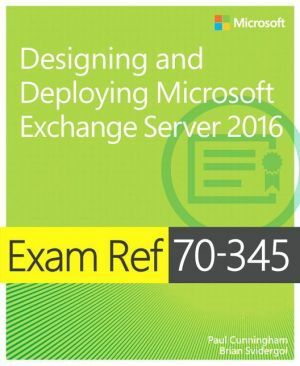 Exam Ref 70-345 Designing and Deploying Microsoft Exchange Server 2016 の 商品情報. While it was only with the advent of Exchange 2016 that ReFS made it into the preferred The exam titled 'Designing and Deploying Microsoft ExchangeServer 2016′ (Exam # 70-345) is currently in beta and is proctored by Pearson VUE. Exam Ref 70-345 Designing and Deploying Microsoft Exchange Server 2016 skills for designing, deploying, and troubleshooting for Exchange Server 2016.